Regional information minister for the Eastern Lakes state Taban Abel Aguek said the plane, carrying 23 people, had crashed in the central town of Yirol as it came in to land. The number of people we have confirmed dead is 19 people and four people survived. Nineteen people were killed on Sunday when a small plane crashed into a lake in the centre of South Sudan, while four people including two children survived, a regional official told AFP. "The number of people we have confirmed dead is 19 people and four people survived," said Abel, adding that two children were among the survivors, as was an Italian citizen. Abel said the Anglican Bishop of Yirol, Simon Adut, was confirmed among the dead. The Italian non-governmental organisation Medici con Africa Cuamm wrote on its website that an Italian doctor named Damiano Cantone, who had been on his way to work at a children's hospital in Yirol, was among the survivors. The UN broadcaster Radio Miraya had earlier reported him dead. "The whole town is in shock, the shops are closed, some people have taken their relatives for burial. It is a commercial plane that crashed," Abel told AFP. "When the plane was landing the weather was foggy and this was not a good situation for plane landing." 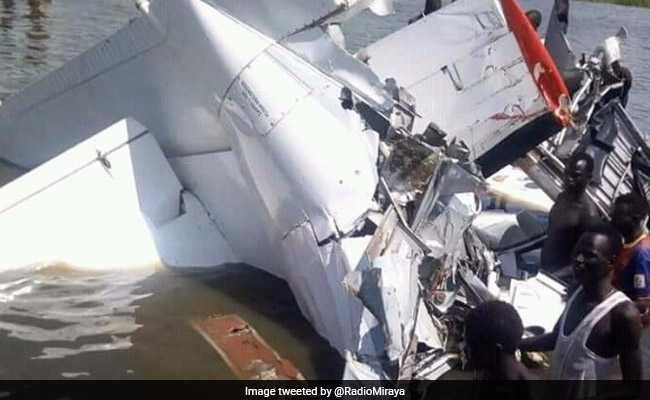 Radio Miraya posted a picture on its Twitter account of the twisted wreckage of the plane submerged in water. Abel described the plane as a 19-seater, however it was not clear whether this included crew seats. A passenger manifesto seen by AFP shows 20 passengers, while Abel said a child on the flight had not been recorded on the manifesto. Overloading of planes is common in South Sudan, and this was believed to have contributed to the 2015 crash of a Soviet-era Antonov plane upon takeoff in Juba which left 36 people dead. South Sudan was plunged into civil war in December 2013, when President Salva Kiir accused his former deputy Riek Machar of planning a coup, leaving tens of thousands dead and millions displaced.